There is a slightly different animation for the ticker at the TOTH on the International/youtube feed - a solid white bar slides up and then wipes to the left to reveal the ticker instead of the normal straight slide up from bottom seen on the domestic feeds. I would guess that this is to avoid the clock sliding up from the bottom and disappearing behind the skynews.com bug every hour! My mistake, for some reason I thought the new newsroom/galleries was in Sky Central. That must have been a recent change, as you definitely used to get a flash of the clock. I notice the web address cover up animates in with it (again didn't used to do that), which suggests the new animation is part of the DOG. It also seems they haven't properly set it up for the Sky News at Ten titles, having just skipped back on the YouTube stream the white bar animates in over the tites at the time the ticker usually would every other hour, and animates out before the ticker appears, so you still get the flash of the clock. Ah yes, you're right, I've not seen the start of Sky News at Ten on International before so I've not seen it. You can still rewind to 9pm and see what it's supposed to look like (or 11pm if you go back 5 mins). You still get a flash of the clock as it slides away for trailers into some breaks. Less noticeable than on the TOTH though. I'm not sure when it was introduced, I assumed it was from the start but guess not. 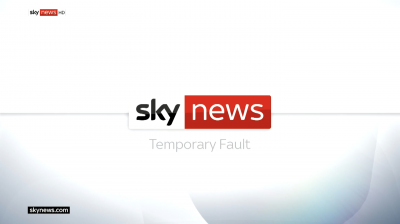 'Temporary fault' slide seen before Ian King Live on the YouTube feed. Don't know if this went out on the TV feed. YouTube also showed the advert break instead of the usual filler. UK TV didn't see the slide, it went from the ad break to Ian King Live as normal. Also the YouTube stream had the DOG's on over the ad break, whereas UK TV didn't. Both feeds did have trouble going in to the ad break before Ian King Live, both playing the Qatar Airways weather sponsorship bumper at the point the break should have started, before returning to the gallery output. It took a few attempts to get the break to play, as the gallery output and the DOG's faded in and out a few times before it eventually played. It looks as if the TX playlists were setup to go to the weather rather than straight to the break, and whoever is operating it had to quickly shuffle the UK playlist and crash next to get it to play, and put International/YouTube to the fault slide once UK was sorted. There's been a few mistakes like this lately, I saw one of the international fillers go out in the middle of the UK ad break not long back. Later in the summer, "Ian King Live" will move to the CNBC building, which will also be used as a down-the-line and breaking news point, mostly if not exclusively for business stories. Isn’t the CNBC Bureau housed at the WSJ? rendered void when Fox Business launched) and polling. Considering Fox Business 2007 I’m surprised they are still colocated. Edit 2: Looks like they aren’t colocated anymore and the licensing deal expired in 2012. It appeared to cover business news only. However the networks over here usually pair up with a newspaper to do political polling and NBC News has continued since 2012 continued timoartner with the WSJ to conduct political polling, in the U.K. don’t the BBC, ITV and Sky News all tam yo to hire an outside polling firm. Edit 3: Now I’m curious will they build a separate set for Ian King Live or use the existing CNBC 1? And is there much space at Sky in Osterly to move the operations of CNBC and NBC News in? A small set is being built within CNBC's office space. Nobody is suggesting moving CNBC or NBC News staff into Sky facilities. That is putting 2 and 2 together and coming up with 76. Apologies, I’m not speculating based on the fact that Comcast and NBC Universal have been on a huge kick to colocating as many of their operations in North America and Mexico. If they were planning on to do so down the line would there be space in Osterley, for the space CNBC requires and the 100 or so NBC News staffers would? Along with the CNBC studio, the need a small DTL studio with (the current one has monitors on three walls and three cameras), and a DTL in the newsroom.